The Moroccanoil brand is a well known and trusted beauty product line that built its reputation by word of mouth in the salon industry with a quality product that was made from the finest ingredients. Even though they started out with a single hair product they have since expanded their hair product line and branched out into the realm of personal body care lines. Their products have been highlighted during New York Fashion week and are raved about online. Our nail techs here at Charisma Salon have tested these products and want to share them with you in our best Moroccanoil manicure and pedicure treatments. 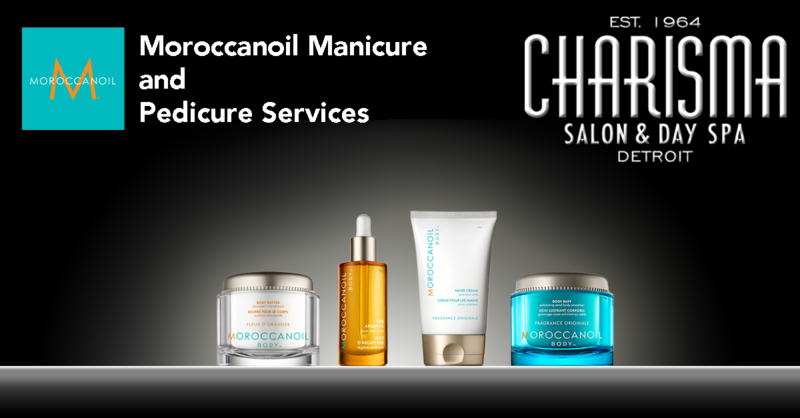 Moroccanoil Services at Charisma Salon! We use several of the Moroccanoil body products in our special Moroccanoil manicure and pedicure services, and want to let you know more about them and how they can help improve the health of your skin and nails. These products are made from some of the highest quality ingredients and contain rich nutrient infused oils such as argan oil, shea butter, vitamin E, and other natural oils*. Major benefits to these oils include healthy hydration of skin and the building of healthy skin and nails. Other benefits include helping skin elasticity, reduction of skin inflammation, help repair sun damaged skin, and can even help reduce the appearance of wrinkles. These products are alcohol and paraben free so it’s gentle on sensitive skin, and is naturally nutrient infused so your skin feels amazing without feeling weighted down. Your skin will feel healthy, light, and moisturized, and your nails will be thanking you as well. So isn’t it about time you treated yourself or a loved one? Call to book an appointment today, and let you or a loved one experience a little bit of bliss during your week with our Moroccanoil Manicure and Pedicure services! *Please note that in some of the products used in our services contain allergens such as almond oil, coconut oils, and other natural oils and can cause issues for those with allergies, please consult our nail techs before your appointment so we can accommodate. Please contact us at our Livonia Michigan salon to request more information and to ask any questions you might have on allergies or cost of getting the best manicure and pedicure or any other nail services in Metro Detroit.